In a few days, one of the most convoluted political spectacles in American history will unfold in all its cacophony. No one who follows politics should be surprised. Within Conservative America, some hard-core groups cannot get over the fact that Barack Obama won the election. These same groups were the ones criticizing Democrats for being angry over election 2000. At least you could say this for those of us Democrats who were angry. There was a legitimate reason to believe that Al Gore won and had the election stolen from him. This time, with a 9 million or so vote margin and massive electoral vote victory, there is no valid reason to have the kind of effort about to be made against Obama. Never fear, the far right is manufacturing outrage with help from corporate sponsors. The protests supposedly have something to do with April 15th, the deadline for filing federal taxes. If you do even a bit of analysis of this reasoning, its clear that it doesn’t work. Obama IS raising taxes on people earning over $250,000 a year, as he promised during the campaign. But he is raising them to a point 10% less than they were during Ronald Reagan's Presidency. (Thanks to gather.com for this chart. If the embed doesnt work, click http://media-files.gather.com/images/d782/d572/d745/d224/d96/f3/full.jpg ) You right wingers reading this remember Ronald Reagan, your quintessential hero, don't you? 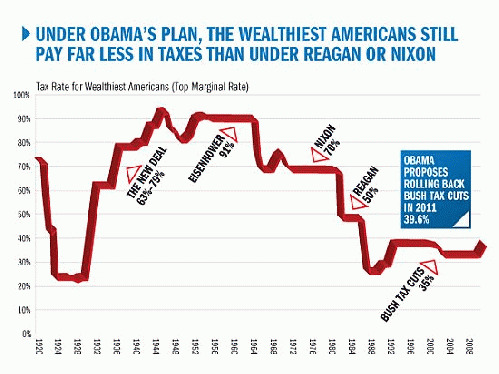 If Obama's top tax rate at 40% makes him a Socialist, what does Reagan's at 50% make him? Ah, but I forget, the protest is also against excessive federal spending. Wait a minute, didn't Ronald Reagan also start the modern practice of massive federal deficit spending? (Thanks to zfacts.com for this chart, if the embed doesn't work, click http://zfacts.com/metaPage/lib/National-Debt-GDP.gif ) It is unavoidable. Everywhere you turn, this protest is an exercise in right wing hypocrisy. It gets even better. This article in Media Matters http://mediamatters.org/items/200904090038?f=h_latest points out how Fox News has gone beyond cheerleader for everything conservative to actually becoming an organizer of this tea party event. I wonder if the founding fathers had corporate sponsors? I wonder how big of a war protest we Liberals could have had in early March of 2003 if we had CNN organizing the protests. Another thing has me confused. I thought Republicans didn't do warm beverages. One of their favorite pejorative phrases for Liberals is "Latte Liberals". I thought this meant that Coffee, tea and pretty much everything else warm was out if you were right of center. How are you going to have a tea party if you don't like tea? Or is that the point and are Republicans going to destroy tea like the group that did the original Boston tea party? Also, if this is supposed to have some sort of connection to the Boston tea party, are Republicans going to dress up as American aborigines or some other group and try to pretend it isn't really them doing the protest? That would take the effort up a tick from pathetic to barely interesting, of course it would totally defeat the supposed purpose. Looking at all of this, we have fake outrage regarding fake issues sponsored by non-people (corporations) with a fake symbol (tea). This Republican activism reminds me of the way bands in the former Soviet Union tried to do Rock-and-Roll. It's clear they don't get the concept. However, don't let that fool you into underestimating the amount of noise they will make in trying to do it. Who knows, they might even fool a number of people into believing this laughable attempt at protest means something beyond the obvious. Some Republicans are mad they lost the election and they cannot get over it.